Heres a quick wrap up to this past weeks surf fishing. Sorry there have not been any mid week reports but some computer issues prevented that. After a fantastic Fathers Day with fish being caught up and down Hutchinson Island, the mid week bite was challenging. I returned to Stuart Beach on Monday morning and found the nice water color that had been there all weekend had been replaced by a lime green dirty shade. It didnt take long to figure out that freshwater had made its presence known with the absence of any bites and vegetation floating along the edge of the beach. I took a ride to the north and stopped at Middle Cove and found brown streaky run off water there. The good news is leaving Governor Rick Scott rode his white horse onto the scene and issued an emergency order to curtail the volume of Lake O discharges. I listened to Ed Killer on The South Florida Fishing Report as he was talking with Fred from the Snook Nook and if I interpreted what he said , Congressman Brian Mast may have had more of an impact as he demanded a stop to the discharges on the floor of the U.S. House on Thursday. Mast also invited the Army Corps of Engineers to come take a swim in the St. Lucie River. A cutback should help the situation but it is not going to eliminate the problem . I have to add that when I returned to fish Stuart Beach on Wednesday a tourist came running down the beach ,taking pictures of two large fish swimming in the trough. He informed me that these fish were heading my and I assumed they were snook swimming along the edge. I was shocked to see two large alligator gar making there way south . I packed my gear up and went home. 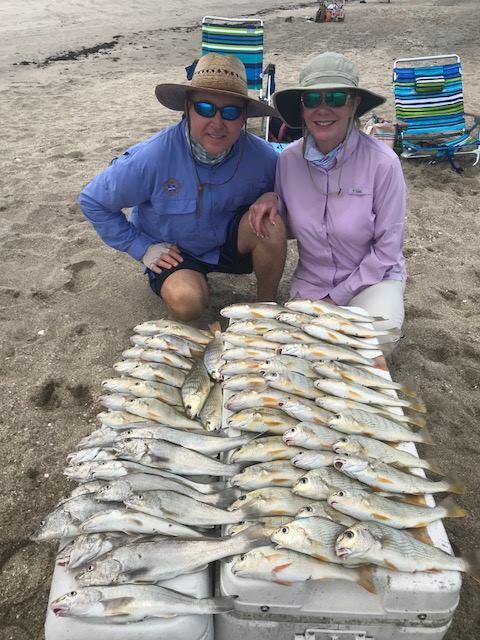 Today, Sunday, Iam happy to report that my son Randy and I caught some nice whiting at Stuart Beach and I am hoping our water quality will improve during the week. Good luck and catch em up. The weather looks good for the weekend so hopefully you can make it out. Inshore the snook bite has been good with some nice fish around the spoil islands around first light with top water and live bait with a few big trout mixed in. The reds have been hit or miss but there is a few nice fish to the north of north bridge. 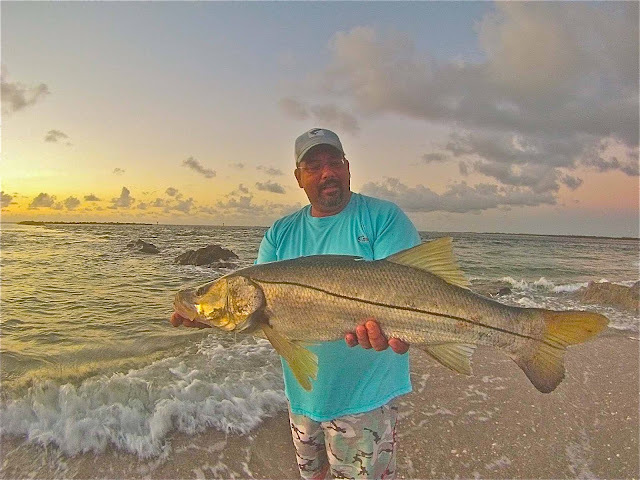 The beach fishing continues to be good with snook and tarpon in the bait schools. Cooking the Catch! Mangrove Snapper FISH TACOS!! I hope everyone who planned on fishing our beaches today got out and enjoyed the great weather and excellent surf action that was evident along our local beaches. I had the pleasure of taking Eric and Laura Hutter of Palm City to Stuart Beach on a surf charter and what a great day it was. These two are accomplished anglers, but new to surf fishing during the summer months on the Treasure Coast. They certainly picked the right day, as they caught lots of nice whiting, croaker, and one jack from this morning until early this afternoon. Fishbites and cut shrimp were once again the baits that put the fish in the cooler and all of the bites occured in the first trough 5 to 5 yards from the beach. I also spoke with a friend who fished at Middle Cove today and he caught some nice whiting along with a number of bonefish at that location. We are finally seeing some great conditions to fish the beach with light winds and a calm surf. Looking ahead to this week the forecast remains excellent and I expect the whiting, croaker, jacks, and bonefish to continue to bend the rods. 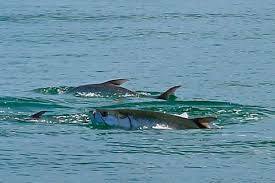 We did see a nice school of pilchards moving to the south and the tarpon and big jacks should be right on their heels as the amount of bait starts to increase . Have a great week and catch em up. INSHORE: Catch and release snook fishing remains the main game in town right now. Look for the snook to be most active at night around area bridges. With current water conditions (dark and fresh) tide has not mattered quite as much as usual. Flair Hawk jigs and swimbaits are a solid choice for the snook right now. Some big jacks in the ICW. Mangrove snapper action has been fair around area bridges. SURF/PIER: The Juno Beach Pier continues to produce a few kingfish early in the morning and late in the afternoon. Large swimming plugs (X-Raps and Yo-Zuri Longcast) and live baits on a trolley rig are the best bet for the kings. 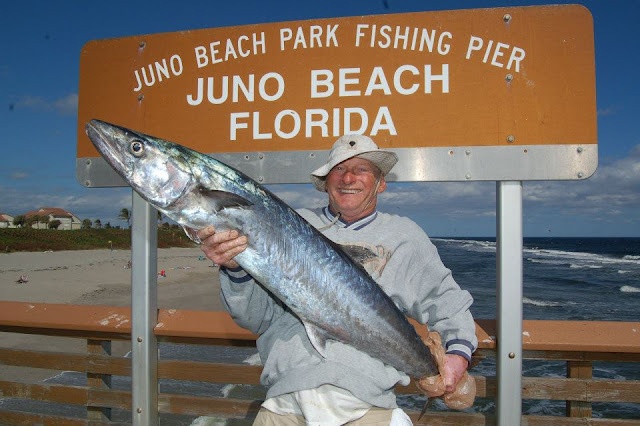 Spanish Mackerel action has also been good at the pier with Jacks in the Mix. The snook are starting to bite a little better at the pier; but the big females are still not fully set in. Croakers and whiting are biting in the first trough. Still a very few straggler pompano hanging around, especially north of Jupiter Inlet. Good number of tarpon moving along the beach right now; getting bites out of them has been a little tough. Fishing in June goes like this, some patterns are ending, and some patterns are just beginning. 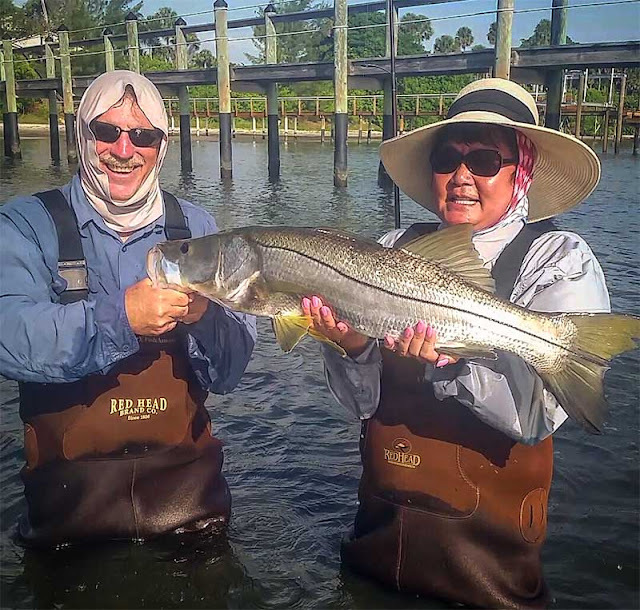 Snook season is now over but their summer pattern is just beginning. When fishing for snook over the summer months, you want to be extremely gentle with them because they are doing their annual spawn and there will be some big females that need to be released very quickly. Always support the belly of the fish. Never hold it vertical for a picture. If you are going to use live bait, make sure you are always using a circle hook for a good survival rate. If you are fishing from jetties or piers, make sure you put the fish in your net and release it properly. Please do NOT throw it back into the water. If we want to have a good survival rate for these fish, all of us need to consider this when releasing big snook in the summertime. Getting out very early and fishing in the river at sunrise will give you a good opportunity to catch some nice summer snook on top-water lures. If you don’t like to get up early, you could always go to the beach and some of the jetties for good action. Now that the sun is up, you will have to use live bait, such as little greenies, small mullet or even a small sand perch will be perfect for some of these fish that will be cruising in the first trough at the beach. Fish at the jetties will be closer to the rocks or in some deeper holes ambushing their prey. The current will dictate how much weight you need. Sometimes a quarter-ounce works and sometimes a three-ounce weight is what it will take to hold bottom. Good size tarpon should begin showing up. Having the right tackle to battle the silver king can be the most important part to landing one from land. 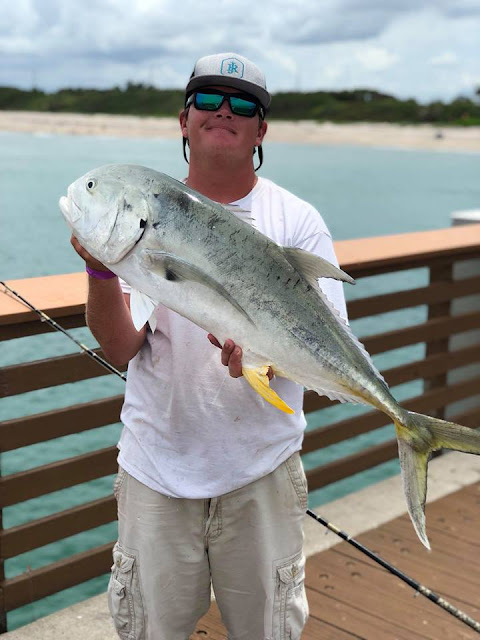 I highly recommend when you are going to the beach or the jetty always bring a light seven-foot six-inch spinning rod for the snook and other fish that will be close. And one that is eight-or nine-foot with a spinning reel that will hold at least 300 yards of 50-pound braid. This will allow you to throw further out to rolling fish and leave you enough line for the battle. Get out early in the morning or late in the evening when these fish will be most active, even going during the night time. This time of year, I find myself doing a lot of night fishing, and that is a conversation for a different day. Black Tide 2018--The Lake Okeechobee Discharges Begin Again!!! INSHORE: Catch and release snook fishing will remain the main game in town right now. Best snook bite will be at night, but a few can be caught during the day as well. Look for the biggest fish to be staged up somewhere close to or in an inlet right now. Big swimbaits and flair hawk jigs remain a solid lure choice right now, especially if your looking to catcha big snook. The ICW has been holding a few big jacks along seawalls early in the morning. A large noisy topwater or big live mullet is the best choice for the big jacks right now. Look for the jacks to be most active early in the morning and late in the afternoon. Mangrove snapper action is picking up around area bridges. Some good reports of some big sandperch in the ICW on small pieces of cut shrimp. SURF/PIER: The Juno Beach Pier has been pretty hot this week. A fair number of kingfish have been around first thing in the morning and then again late in the afternoon. A live bait on a trolley rig or Rapala X-Rap is the best choice for the kingfish. Lowlight periods of the day (morning, late afternoon, or heavy clouds/stormy) are the biggest key for getting a kingfish bite. MIxed in with the kingfish have been a few bonita, some big jacks, and a few tarpon. The snook bite continues to improve on a daily basis . Live baits(threadfins, pilchards, sardines, croakers) have been good for the snook, as have dead sardines and bonita chunks. 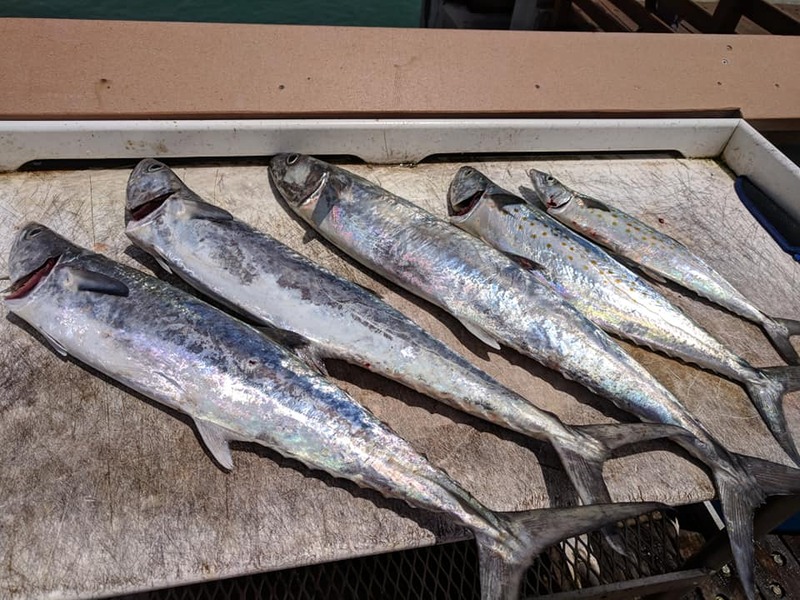 The Spanish Mackerel have been around the pier in fair numbers as well. White crappie jigs, small Rapala X-Raps, and free-lined small live baits are the best choice for the Spanish Mackerel. Croakers and sandperch are in the first trough and biting small pieces of shrimp. It's pretty late for the pompano, but a few are still being caught as well. Sandfleas and clams remain the bait of choice for the last straggler pomps hanging around. Snook should also start to move along the beach in pretty fair numbers now on the backside of the moon. Swimming plugs will be a good choice for snook along the beach during lowlight periods of the day, while a small white bucktail jig or small paddletail will be a better choice once the sun gets up a bit. Off the Palm Beach area, there have been some tarpon cruising the beaches. DOA lures and live baits are working well. Off the jetties at the Boynton Inlet, anglers are catching small snook and small snapper. Sand perch are being caught on peeled shrimp at the Lantana Bridge. An unusually event occurred recently when several small cobia were caught at the Lantana Bridge. Anglers were using shad that likely came through the spillways. Got a taste for panfish? You’re in luck as the bluegill bite is fantastic. Anglers using crickets and worms and working the canals and Kissimmee River are having excellent luck. The bass bite has been good as well with Eagle Bay and Tin House Cove being good spots as well as any of the spillways that are running. Rat-L-Trap lures and crankbaits are working well in the spillways and top water frogs and plastic worms are being used out on the lake. Brilliant sunshine, calm winds, turquoise water, and absolutely great surf fishing was the total result of the past two days along our local beaches. It has been some time since we have had conditions like the past two days and I hope everyone got out and enjoyed all of it. I fished the last two days with my oldest son, Paul and his wife Jennifer who are down here on vacation from Long Island, my son Randy, and friends Marty Barlow and Barry Rashkin. We fished at Stuart beach both days and the action was non-stop. 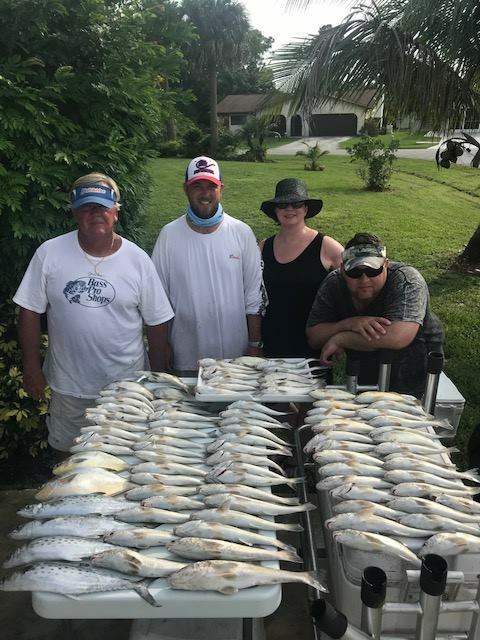 Pompano, spanish mackerel, whiting, and croaker were all on our catch list. Since Paul and Jennifer were hoping to vacuum seal some fillets to take back north, their timing couldn't have been better. The whiting and croaker bite in the first trough right now is off the charts and the usual recipe of Orange Clam Fishbites & cut shrimp accounted for all of the near shore action. The trough is loaded with these tasty fish and the bites come almost instantly when your rig hits the bottom. Randy caught some nice spanish mackerel by casting a krocodile spoon on these fish that consistently appeared throughout the day. The keeper pompano we caught were a nice bonus, especially when they were caught on the short rods fished in the first trough. 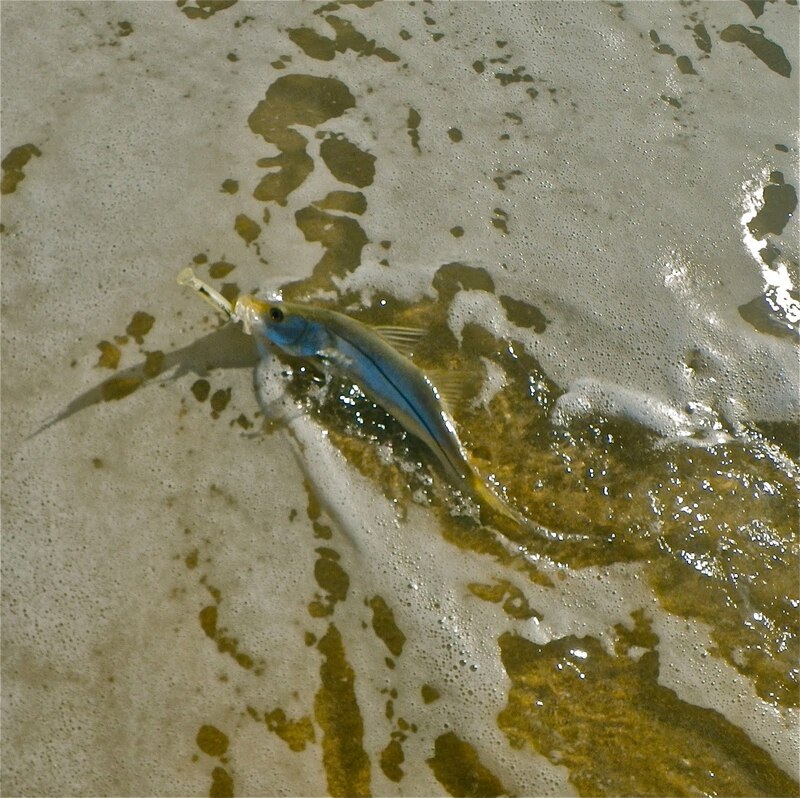 The biggest mistake you can make when targeting the whiting and croaker is casting too far, as all of the activity is within 20 yards of the beach. Look for this great action to continue as we move into summer. It's really nice to see a lot of big whiting making it into the cooler. My daughter-in-law Jennifer showed us all how to do it right, as she landed a huge 2 pound whiting on a Fishbite. 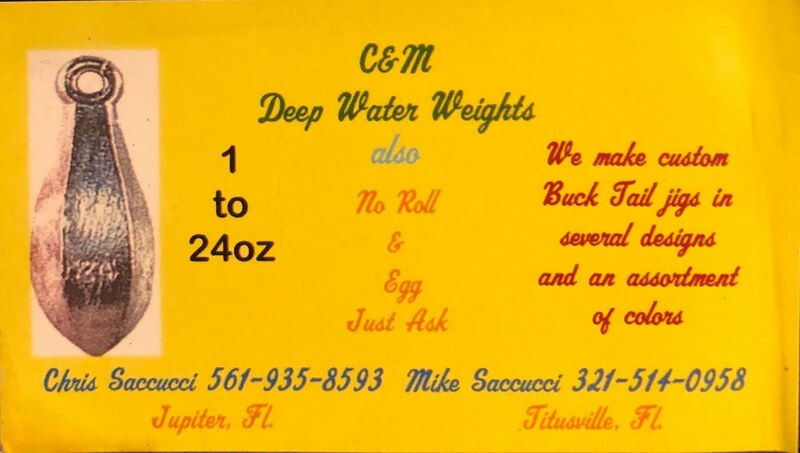 Light tackle, Fishbites, and cut shrimp are all you need to have a great day on the beach . Inshore the snook bite has been good live bait has produced the best with a few big trout around the mangrove shore lines to the north around first light. The water is still a little nasty hopefully it will clean up soon. The beach fishing is starting to get good with a few snook and tarpon in the bait schools find the bait and you will find some fish. If anyone had any doubts about our great early summer surf action bouncing back after Alberto, I hope this report will put those ideas to bed. I took a quick look yesterday at a few of the local beach accesses and was greeted with dirty brown run-off water. But today was a different story as some of the clean green color we had before this last front was back. Stuart Beach was the location, and the whiting were there in big numbers. Orange Clam Fishbites and small pieces of fresh shrimp accounted for all of the fish caught. The water has definitely cooled off with all of the run-off but the whiting seem to have acclimated to the temperature change. They bit the entire time I was there and I left them biting two hours after the tide had peaked. They were 15 to 20 yards from the edge and repeated casts to the same part of the trough brought instant strikes. 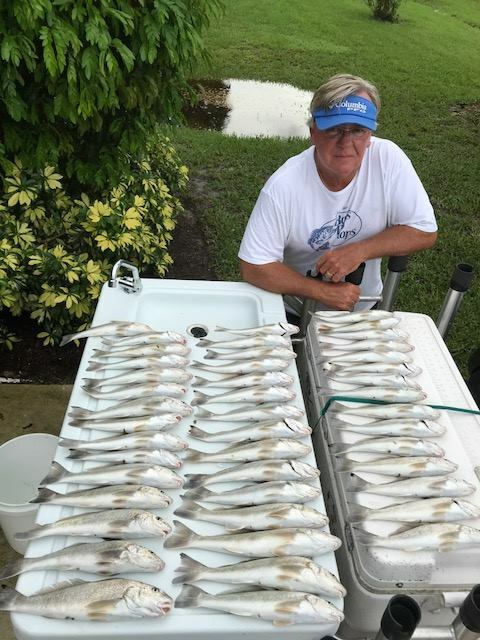 I am sure a fish fry is in my plans for this weekend as well as filling a request from my friend, Capt Mark Dravo of YB Normal Fishing Charters in Fort Pierce, for his favorite fish - whiting. The only other type of action I experienced was from a hungry snook that engulfed a whiting as I reeled it in. I thought I had a snook dinner in the making but it only measured 26 inches so it had to go back. The snook season closes tonight for the summer, so that one will have the chance to become a keeper next year. We are going to have to deal with more run off and Lake O discharges as it was announced that the pumping is going to start tomorrow. My advice to everyone is if a certain beach has water affected by the fresh water, then look at other accesses as currents, tides, and winds could improve the water quality and fish holding potential. The weather is predicted to be pretty darn good for the next 4 to 5 days so get out and bend a rod. A stop at the Snook Nook for some fresh shrimp and a bag of Fishbites will be your ticket to success.